This is a scream - whatever it's about! Wow. This is some really messed up arabic. And I have seen messed up arabic before. No offense but writing a comic in mistranslated Arabic while your characters are supposedly Moroccans is a complete lack of knowledge of the Moroccan culture. Moroccans don't speak Arabic, they mostly speak Darija. A Darija-speaker wouldn't understand that comic and an Arabic-speaker wouldn't understand a Darija comic. However it was kind of funny. No offense taken, and none intended. This was meant as an April Fools joke for my largely English-speaking and -reading audience, a cultural cliche wrapped in on itself. 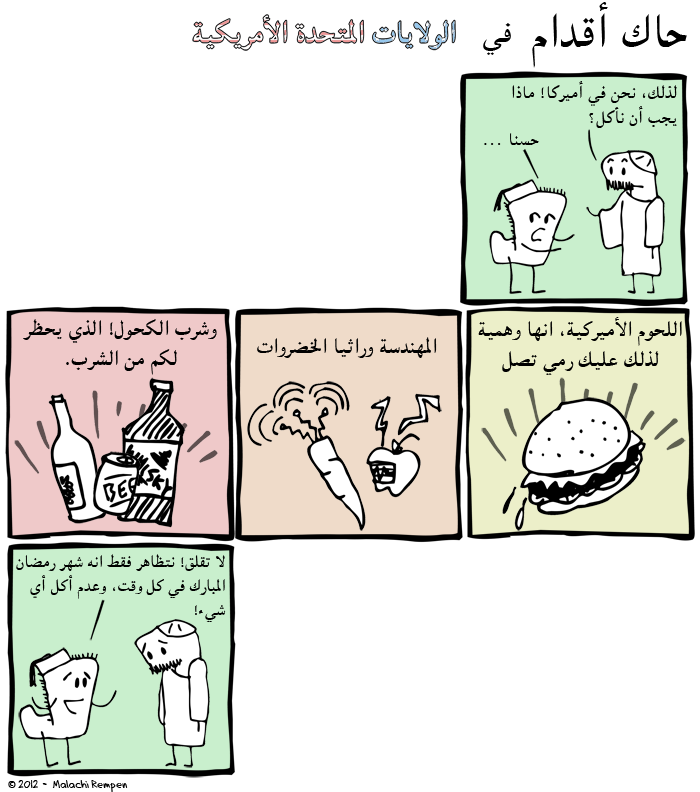 It was not meant to in any way be a functional comic from an Arabic point a view, let alone a Moroccan! So I guess, if nobody understood the comic, it was successful! April Fools! Ahahaha! The arabic is horrible (Google translate, I suppose?) but extremely hilarious. And it's exactly how I felt when I went to the United States. Yeah, Google translate. I'm glad you find it funny, I always felt this comic was a complete failure! The translation of the comics' title is just hilarious :D !! Even with such bad Arabic, I could get the joke hahaha ! I can relate, I moved to Germany 3 years ago and the first couple of months here I switched to being semi-vegeterian until I located 'Halal' meat stores :D ..
Glad you managed to pull some sense out of this comic. But you can eat pretty great mideast food here in Germany! At least, it seems that way to me. As someone who does not understand Arabic, do you have any suggestions as for how I can translate this into English? I have tried OCRs but so far none are successful, but perhaps there is a particular one this works on?